What are our duties or rights? How should we act? What are we responsible for? How do we determine the answers to these questions? 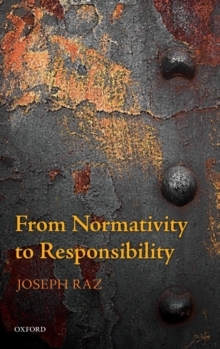 Joseph Raz examines and explains the philosophical issues underlying these everyday quandaries. He explores the nature of normativity-namely, the fact that we believe and feel we should behave in certain ways, the reasoning behind certain beliefs and emotions, and various basic features of making decisions about what to do. He goes onto consider when we are responsible for our actions and omissions, and offers a novel account of responsibility. We can think of responsibility for unjustified actions or attitudes as a precondition of the blameworthiness of a person for an attitude or an action, or perhaps for a whole set of actions,intentions, or beliefs. Responsibility for justified actions or attitudes may be a precondition of praiseworthiness. Either way responsibility may point to further consequences of being justified or unjustified, rational or not. But crucially, responsibility attaches to people in a more holistic way. Some people are responsible for their actions, while others are not. In this way, Raz argues that the end is in the beginning, in understanding how people are subject to normativity, namely how itis that there are reasons addressed to them, and what is the meaning of that for our being in the world.